Carbon nanomaterials are a growing family of materials of different formations, such as black nanoparticles, fullerenes, carbon nanotubes (CNTs), fibres, and other related forms [3, 4, 5, 6, 7, 8]. For instance, carbon black (CB) nanoparticles are traditional nanosized carbonaceous nanomaterials with a morphology consisting of grape-like aggregates of highly fused spherical particles, while carbon black is a quasi-graphitic form of nearly pure elemental carbon and presents as a major part of the ambient air pollution [9, 10]. C-fullerenes (C60) are characterized by symmetrical closed-cage structures that consist of 60 carbon atoms arranged in the shape of a soccer ball . CNTs are fibrous materials with high aspect ratios and needle-like shapes, sharing physical similarities with asbestos fibres . CNTs exist in two principle forms, namely, single-walled CNTs (SWCNTs) and multiwalled CNTs (MWCNTs), and can assume a wide variety of derived structures, such as horns, loops and peapods . Single-walled carbon nanohorns (SWCNHs) are horn-shaped single-walled tubules with cone angles of approximately 20°. SWCNHs are synthesized by laser ablation and are essentially metal-free with high purity . In addition, nanographite (NG), also called graphite nanoplatelets, is a one-atom-thick and two-dimensional sheet of sp2-bonded carbon atoms . 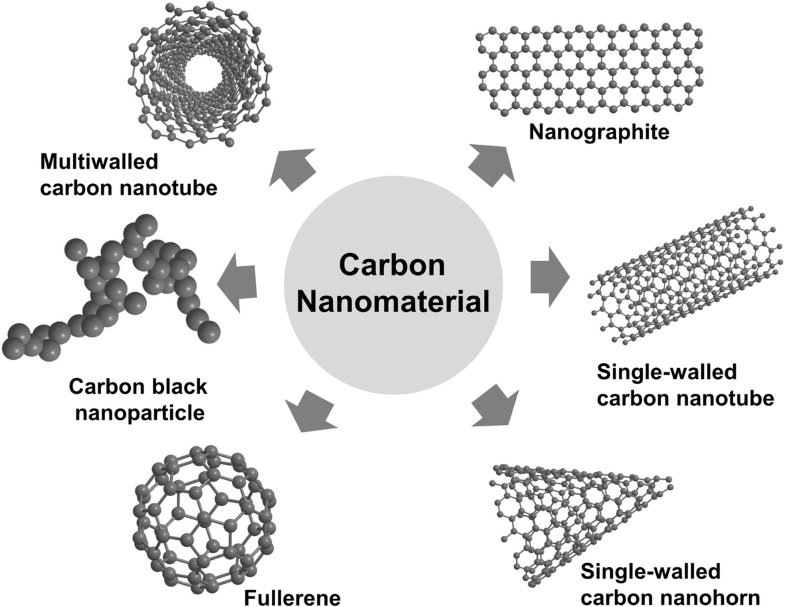 Each type of carbonaceous nanomaterial has a distinguishable shape. In addition to manufactured nanoscale carbonaceous materials, naturally occurring carbonaceous particulates range from 1 to 100 nm in size exist. For instance, these materials exist in the emissions from certain combustion processes, such as the burning of methane and propane [12, 15]. Numerous studies have endeavoured to evaluate the health impact of occupational and environmental exposure to carbon nanomaterials [12, 16, 17, 18, 19]. 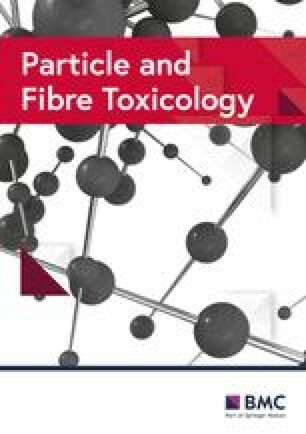 Studies on air pollution and mineral dust particles demonstrated that inhaled particles with a size < 100 nm caused lung injury through reactive oxygen species (ROS), cell damage and inflammation [20, 21, 22, 23]. In vitro models have been developed for cytotoxicity studies to eliminate some variables in animal studies so that researchers could achieve better control over experimental conditions. A number of studies evaluated the harmful effects of carbon nanoparticles on various cell types, and as the first-line of defence against foreign particles, macrophages were mostly studied. Previous studies reported various toxic effects of carbon nanomaterials, including ROS generation, DNA damage, lysosomal damage, mitochondrial dysfunction and eventual cell death via apoptosis or necrosis [24, 25, 26]. The different results of the cytotoxicity of carbon-based materials might be related to many factors, such as the differences in the physicochemical properties or structures of carbon nanomaterials, types of target cells and methods of particle dispersion. As previously described, MWCNT carboxylation resulted in damage to the carbon framework and promoted CNT degradation since carboxyl groups combined with associated defect sites, facilitating interaction with lysosomal enzymes [72, 73, 74]. Additionally, the damage to the CNTs framework triggered increased degradation in simulated phagolysosomal fluid . A comparative toxicity experiment was performed between acid-purified MWCNTs and concentrated acid-functionalized MWCNTs-COOH . As expected, MWCNTs-COOH yielded less cytotoxicity than MWCNTs, whereas the latter reduced cell viability and increased the release of inflammatory mediators . The binding of human blood proteins to SWCNTs reduced the toxicity of the latter in THP-1 cells and human umbilical vein endothelial cells (HUVECs) . Not only size and dispersion in aqueous solution, but also the degree of functionalization by protein influenced the toxicity of carbon nanomaterials. The cytotoxic effect of CNTs functionalized with a 46-kDa surface protein was evaluated in J774A macrophages. The results showed that functionalized P46-CNTs displayed grade-dependent cytotoxicity, that is, P46-CNTs of high grade were more toxic than those of low grade . Additionally, the nature of the functional protein influenced the cytotoxicity of nanoparticles. Functionalization with even a small amount of the 220-kDa lectin (L220), an immuno-modulatory molecule, decreased the cytotoxicity of CNTs, whereas fluorescein isothiocyanate-functionalized CNTs (FITC-CNTs) presented a greater toxic effect on macrophages, mainly characterized by necrosis . Tau-MWCNTs are MWCNTs that have been modified with taurine on the surface and are more water-soluble than raw-MWCNTs. Cytotoxicity assessment demonstrated that tau-MWCNTs exhibited lower cytotoxicity than raw-MWCNTs . Additionally, it was reported that functionalized SWCNTs that were water-soluble showed reduced cytotoxicity compared to nonfunctionalized SWCNTs in human dermal fibroblasts . Several studies have reported that pristine CNTs are insoluble and induce cell death in vitro. Chemically modified CNTs are highly water-soluble, and their cytotoxicity is associated with their degree of functionalization [45, 79, 80, 81]. The majority of the works of carbon nanomaterial-mediated immune cell responses, including the effects on cellular uptake, cellular viability, and induction of inflammation, have been carried out on macrophages. Several studies have suggested that engineered nanoparticles might influence the cellular uptake of macrophages. For instance, shorter CNTs can be engulfed by different immune cells in vitro; however, long CNTs induced the so-called frustrated phagocytosis in macrophages, which triggered persistent inflammatory responses and increased the production of ROS and cytokines [85, 86]. Internalisation of CNTs by immune cells is also a critical determinant in biomedical applications . Macrophages, as typical phagocytes, are very attractive targets for selective drug delivery . Poor recognition of CNTs by macrophages is prohibitive of macrophage-mediated “surveillance” [18, 89], whereas functionalization of CNTs increases their recognition by phagocytes and other cells [80, 90, 91, 92]. Apoptotic cells expose an anionic phospholipid, phosphatidylserine (PS), on the cell surface as the “eat-me” signal for recognition and uptake by macrophages . In one study, PS-coated SWCNTs were recognized by different phagocytic cells (i.e., murine RAW264.7 macrophages, primary monocyte-derived human macrophages, dendritic cells, and rat brain microglia), and their uptake was suppressed by the PS-binding protein Annexin V. Additionally, PS coating changed the pro- and anti-inflammatory behaviours of macrophages induced by nanoparticles . Another study demonstrated that phenylboronic acid (PB)-modified carbon dot nanoparticles could be taken up by macrophages with low toxicity and high efficiency compared to unmodified nanoparticles. The findings suggested that these modified nanoparticles are good candidates for delivering drugs to suppress or eliminate aberrant immune cells, such as tumour-associated macrophages . 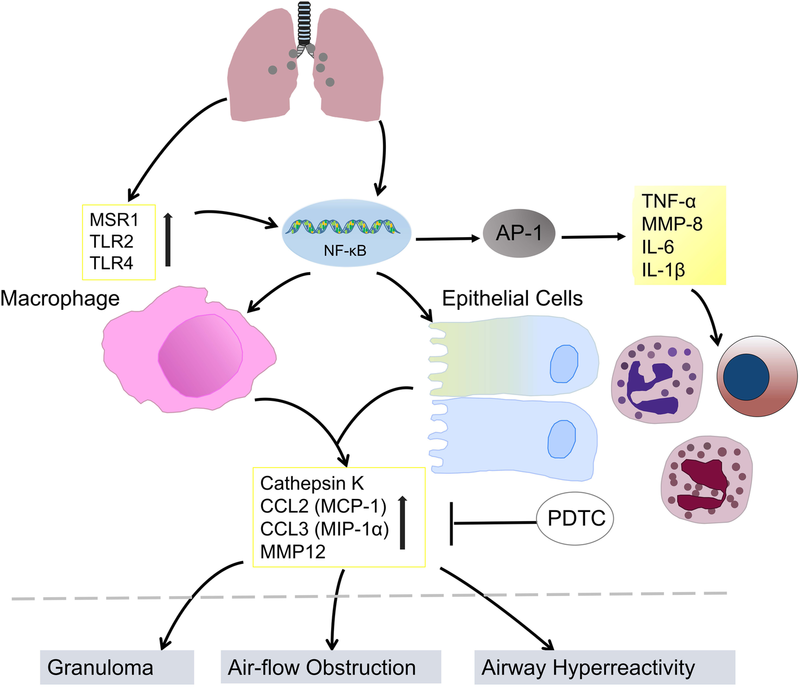 Alveolar macrophages, as resident phagocytes in the lung, play a central role in particle removal by nonspecific phagocytosis. 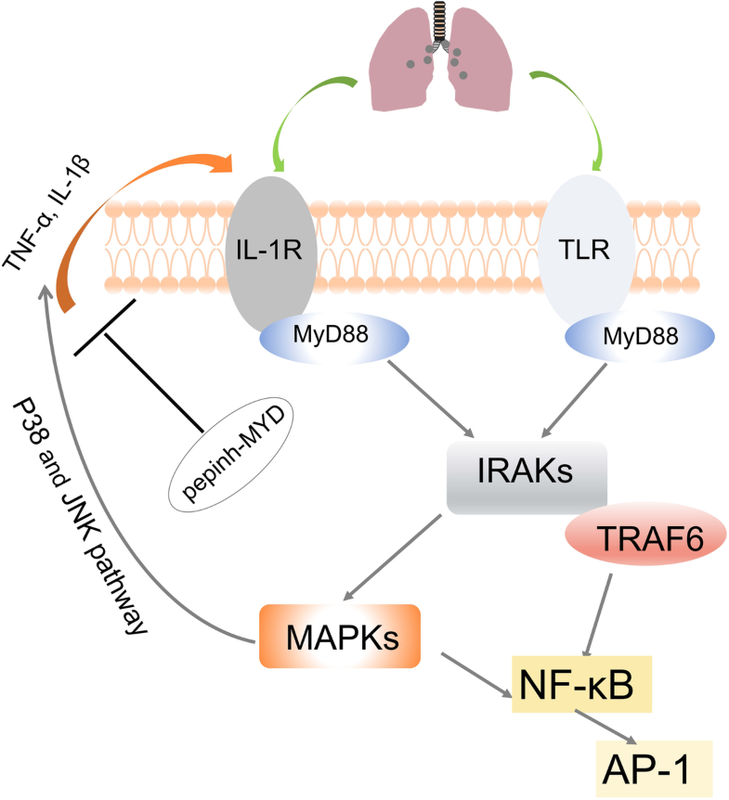 The first response of macrophages against inhaled particles is to recognize these particles by cell surface receptors, such as the mannose receptor (MR), the toll-like receptor (TLR) and the scavenger receptor (SR) [108, 109]. MR-mediated phagocytosis results in a variety of downstream events, including the permeability of the lysosome, the generation of ROS, the activation of NF-κB and the release of proinflammatory cytokines, such as IL-1, IL-6, and TNF-α [110, 111, 112, 113]. However, SR-mediated phagocytosis is not accompanied by proinflammatory cytokine secretion and NF-κB activation . PEGylation is widely used for surface modification of nanoparticles, increasing nanoparticle stabilization and prolonging circulation time in the bloodstream . Surface PEGylation of carbon nanotubes makes the nanoparticles dispersible in aqueous solvents, which improves their utility in a variety of applications [141, 142, 143, 144]. One study reported that PEGylated nanotubes induced elevation of SC5b-9, and in C1q-depleted serum, nanotubes mediated complement activation, indicating the independence of classical pathway. Intravenous administration of PEGylated nanotubes (1.2 mg/kg) in rats induced a remarkable increase in plasma thromboxane B2 levels, which suggested that nanotube initiated complement activation in vivo . MWCNTs-PEG, despite differing PEG molecular weights, led to increases in serum levels of C4d [145, 146] and SC5b-9  in a concentration-dependent manner, which is indicative of complement system activation in human serum. To shed light on the role of PEG surface engineering in complement activation, one extended study was performed with MWCNTs-PEG of different chain lengths. The results showed that all PEGylated nanotubes were capable of activating the complement system equally, independent of PEG loading length . Albumin-coated SWCNTs were more water-soluble and activated C1q-mediated classical and alternative pathways differently. These findings provide insight into the utility of nanomaterial surface modification to increase innate immunocompatibility .